Have you been on Hoover Street lately? New shops, cafes and a yoga studio have opened amid the auto body shops, long-time stores and bungalows. Jacqueline Fernandez takes a closer look at what’s going on. Silver Lake — When Joe Keeper decided it was time to move his Sunset Junction barware shop, he wanted to stay nearby but in a more affordable space where street parking was easier to find. That’s why he signed a lease for a storefront in the 600 block of N. Hoover Street, joining several new businesses that are generating more activity and buzz in a sleepy corner of the neighborhood. The new businesses are popping up in a short strip of one-story storefronts and commercial buildings in what is primarily a residential area. It’s a few blocks south of Sunset Junction — the hub of Silver Lake’s shopping and dining scene — and two blocks east of Virgil Avenue, which has attracted a lot of attention and millenials thanks primarily to Sqirl cafe. 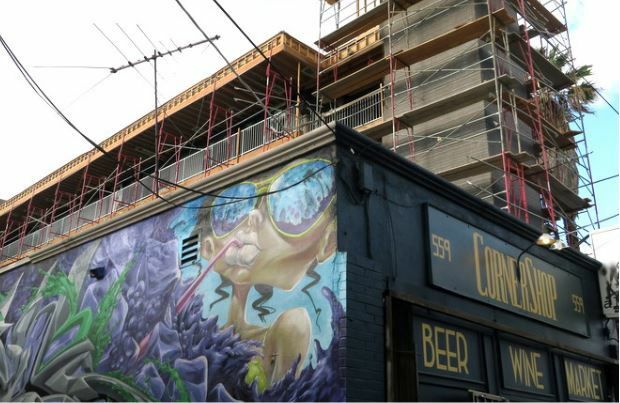 Silver Lake real estate broker Clint Lukens, who has leased storefronts on Hoover, said rents on the street tend to be lower than on Sunset Boulevard even as traffic counts have increased. Being near Virgil Avenue has also helped. 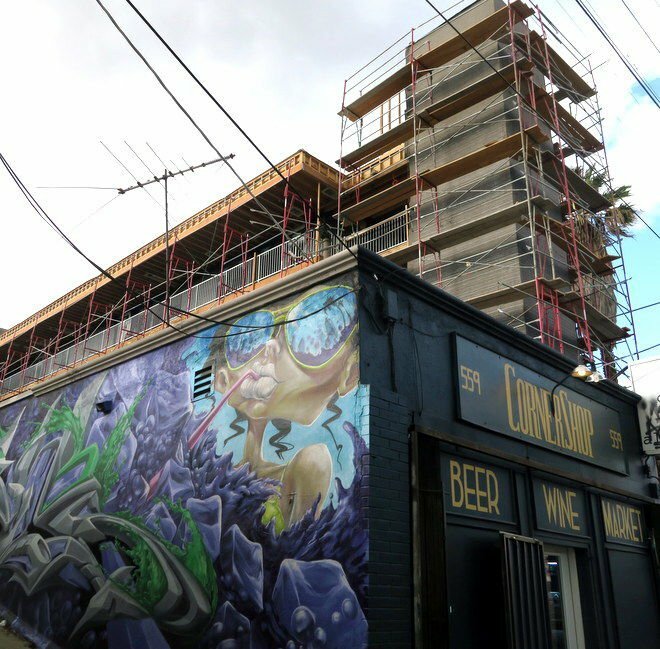 “In the last couple years the 600 [north] block of Hoover has exploded with available space and popularity as locations in Silver Lake/East Hollywood [become] more and more attractive,” he said. This stretch of Hoover certainly doesn’t have the foot traffic or name recognition of Sunset Junction. But all that foot traffic and visibility was not paying off for Keeper, whose Sunset Junction shop offers glassware, spirits, bitters and vintage barware. After conducting a study of his customers, Keeper discovered that walk-ins weren’t spending any money at his store and that moving to Hoover wasn’t going to stop bartenders and destination shoppers from coming to Bar Keeper’s new home. “Gentrification has occurred and parking also is a burden down at the Junction,” said Keeper, who plans to move to 614 N. Hoover St. this summer. Bar Keeper is moving next door to Vinovore, a wine shop opened by Coly Den Haan last year. In addition to her wine shop, Den Haan also opened Hot Hot Food cafe — now a mostly vegan restaurant named Jewel – up the block on Hoover. She is aware that gentrification is an issue in Silver Lake. But Den Haan said she has not received any push back from the neighbors. The customers who patronize the street seem “to be divided [between] the people who have lived here for a long time and are really excited to see new things happening and people who are just moving in to the neighborhood,” said Den Haan. At the corner of of Hoover and Lucile Avenue, Roam Yoga moved into their space last April. Owners Jennifer Perry and Chad Dennis fell in love with the triangular shaped building. “It’s really unique shape and location … felt like it would be an awesome anchor for the neighborhood community center,” Perry said. Bronwen Tawse is another business owner who is looking to set up shop on Hoover. Tawse was one of the co-founders of the Spice Station, the acclaimed Sunset Boulevard purveyor of fine and unique spices and spice blends that closed early last year. Now, Tawse is now crowdsourcing funds to open a spice shop on Hoover instead of Sunset. “With Bar Keeper going there this summer and Vinovore being there already, I think it will be a destination soon enough,” Tawse said of Hoover. The street is lined with a mix of shops, homes and garden sculptures!